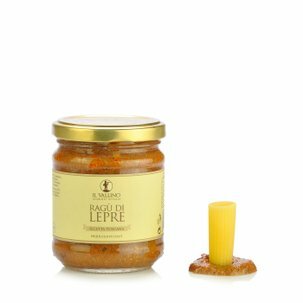 From the great Tuscan gastronomic tradition, here is the Deer Ragù Il Vallino, ideal as a flavourful condiment for hand-made pasta dishes, and in particular pappardelle, tagliatelle and gnocchi. 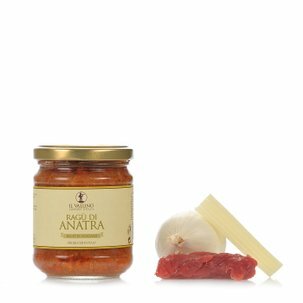 This product is made using an antique recipe that uses a small percentage of pork, tomatoes, oil, onions, natural flavours and black bitter chocolate. 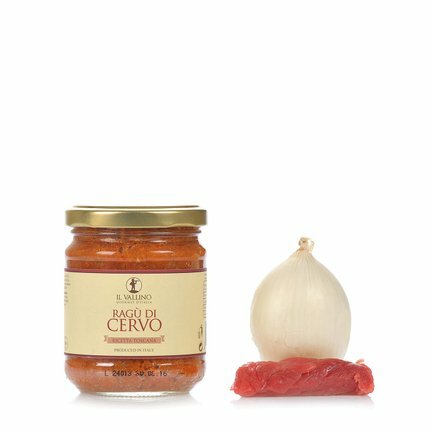 Ingredients Deer 33%, Tomato, pork, onions, extra virgin olive oil, tomato concentrate, red wine, salt, dark chocolate (contains soya lecithin), garlic, pepper, rosemary, bay leaf. ALLERGENS: SOYA and soya-based products; MILK and milk-based products (including lacto For more information on product labels, please contact our Customer Service department. The information on the labels of the products may vary for reasons beyond our control, therefore, there may be discrepancies between the information on the site and that on the products delivered. Please always check the information on the product before consumption or use. In the heart of Val di Cecina, the company Il Vallino is known for its artisan products and conserves that it produces with attention and care. 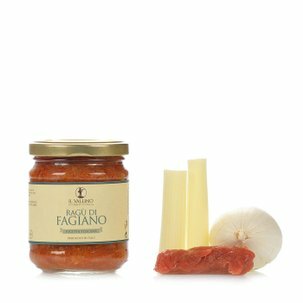 The ingredients used are the best that Tuscany can offer, processed according to traditional recipes kept by the Vallino family. The ingredients are also selected with maximum respect for the seasons, and prepared using innovative techniques that keep the oldest traditions intact. 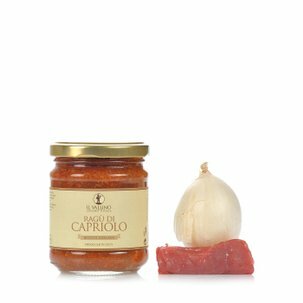 Il Vallino is a genuine representative of the Tuscan tradition, loved and appreciated in Italy and around the world.